We provide high volume Rotary Cup Filling Machines for many industries including food, dairy, and cosmetics. These machines are designed to denest, fill, seal, and lid your products into stackable containers.Our Rotary Cup Filling Machines are fully automatic and can deliver up to 50 cups per minute per lane (dependent on container, product and seal type). The entire line of Volumetric Technologies cup machines comes equipped with advanced design features to guarantee products are packaged to your specifications every time. 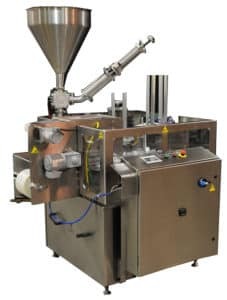 Equipped with a PLC solid state controller and servo drives, our Rotary Cup Filling Machines can easily be configured for your products and containers. All control functions are adjustable via a menu driven operator interface. 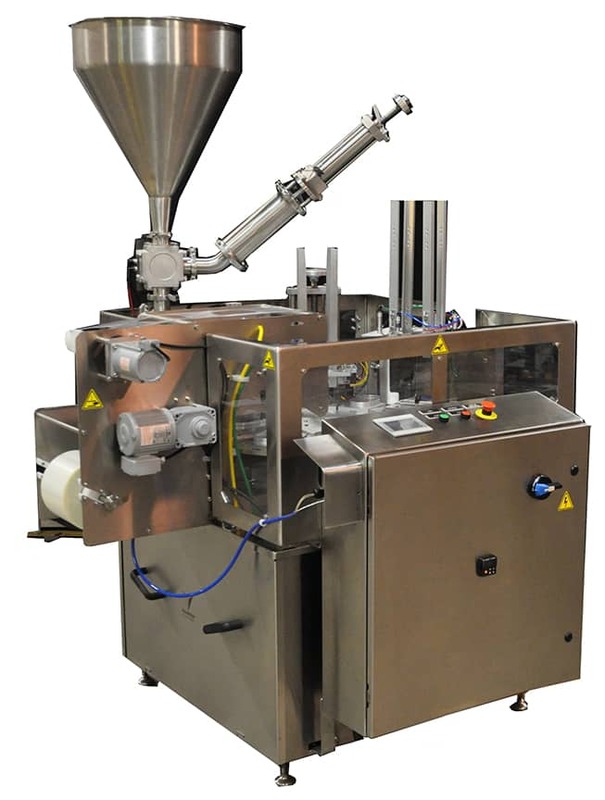 The efficient process of our Rotary Cup Filling Machines ensures fast and accurate filling and sealing of your products. Cups are first delivered into the carrier plates via a vacuum assisted cup denester. The machine indexes to a filling station where liquid or dry products are filled into the cups. Next, the cups index to the sealing station where they are sealed with your choice of seals, and then they are indexed to the lid station where a lid is applied if required. The final step is an automatic ejection of the finished container on to a transfer plate or a take away conveyer.